Rupert Pupkin Speaks: Favorite Underrated Dramas - James David Patrick ""
James David Patrick is a writer of underappreciated fiction and non - with a distracting, lifelong habit of movie-watching. He is currently orchestrating #Bond_age_, the James Bond social media project (housed at www.007hertzrumble.tumblr.com) and blogs about various other nonsense at www.thirtyhertzrumble.com. (Please) stalk him on twitter: @007hertzrumble and @30hertzrumble. An evening ruined by a disgruntled diner (a Charles Laughton cameo) causes nightclub owner Valentine Wilmot to investigate the matter in the kitchen where he discovers several employees in the scullery watching Shosho (Anna May Wong), a dishwasher, dancing on the table. After Valentine fires half of his big dance team “Mabel and Vic” over a matter of a little unrequited love triangle, attendance declines drastically and the nightclub’s fortunes wane (Valentine fires half of his big dance team “Mabel and Vic” and attendance declines drastically). To change his fortune, Valentine gambles big and hires Shosho to perform traditional Chinese dances the gathered masses. Shosho becomes a star, but not without a number of dangerous repercussions. 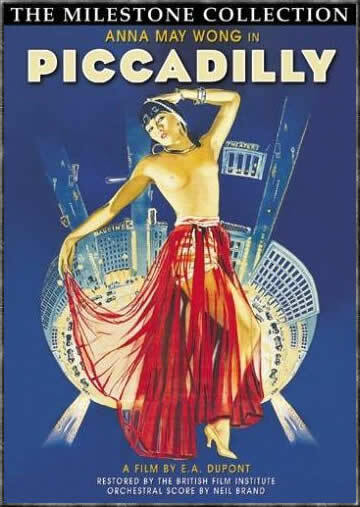 Piccadilly was Anna May Wong’s final silent film and the first of five British movies in which she had starring roles (she left the Hollywood system after being repeatedly cast as Asian stereotypes in supporting roles while non-Asian actresses took lead roles). While Gilda Gray boasts top billing, this is Anna May Wong’s movie from the first moment she’s shown dancing on the table. I thought of this gem from the late silent era because of a recent poll asking for the favorite movies from the 1920’s. I submitted my Top 20 list, which contained Piccadilly sitting between The Last Laugh and The Gold Rush in the Top 10. Yet on no other submitted list did I see a mention of Piccadilly. What gives? For now I’ll choose to believe that it just hasn’t been widely seen. 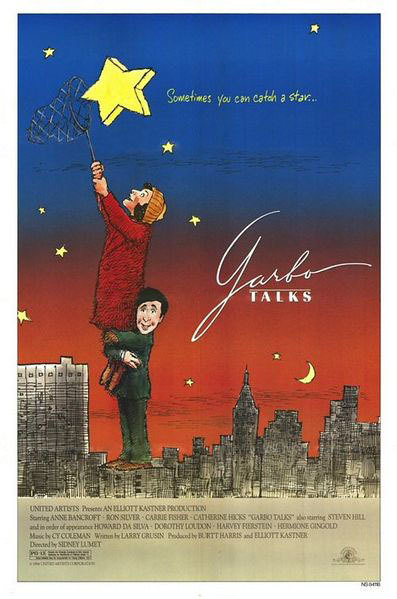 In 2004 the film received a brand new restoration and appeared in theaters and film festivals. Now even the DVD appears to be OOP. Track this one down while you can. Billed as a comedy, but certainly not funny ha ha. Writer/director Bill Forsyth has a long list of offbeat, often underrated Scottish-born dramedies on his resume with Local Hero, Comfort and Joy and Gregory’s Girl. 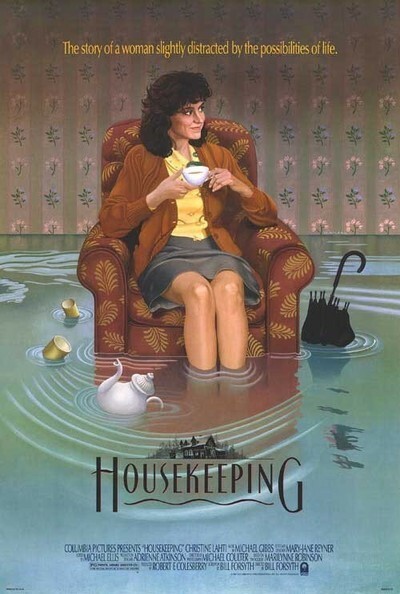 Filmed in British Columbia, Housekeeping is his first North American production. Two young girls are taken on a sudden road trip to visit a relative. Shortly after arriving, their mother commits suicide and they are put in the care of an elderly relative. Hilarious! A few years later Aunt Sylvie (Christine Lahti) arrives to care for the sisters. Aunt Sylvie is, as they say, “a character.” She is at once a creature of curiosity and earnest, cheerful affection (many people find her cheer off-putting and odd) and the two sisters eventually grow apart, partly because of their differing views on Sylvie. Lahti’s Aunt Sylvie comes out of the tradition of characters like Peter Sellers in Being There or later Robin Williams in The Fisher King where you can never be too sure whether they’re completely bonkers or far saner than anyone else in the movie. At the end of his review on Housekeeping, Roger Ebert says he’s just “seen a film that could perhaps be described as being about a madwoman, but I had seen a character who seemed closer to a mystic, or a saint.” Lahti is best known for Running On Empty (another perhaps underseen gem) or the Al Pacino flick …And Justice For All but nothing else I’ve ever seen her do remotely compares to her high wire act performed with Aunt Sylvie. Well regarded but almost entirely unseen. Available from Sony BOD collection. I’m profoundly interested in movies where actors known for being funny guys take on dramatic roles. I considered including Steve Martin’s Leap of Faith on this list as well. Bill Murray’s Razor’s Edge also gets an unfairly bad rap. While Michael Keaton has tackled a wide breadth of genres post-Batman, at this point in the 1980’s, he was Mr. Mom and Johnny Dangerously. 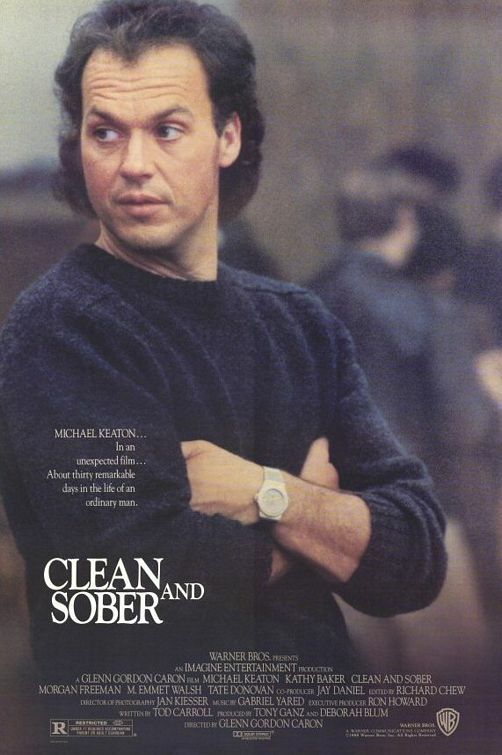 When Clean and Sober was released in August of 1988, Beetlejuice had just left theaters and nobody really wanted to watch Keaton play a loathsome cocaine-addict named Daryl who wakes up with a dead woman in his bed and checks himself into rehab. Keaton, Morgan Freeman and Kathy Bates put on a veritable acting clinic. The result is a focused perspective on the horrors of addiction without any glossy Hollywood misdirection. Keaton’s performance is a punch to the gut. The fascinating relationship between Daryl and his counselor (Freeman) encourages multiple viewings to watch the two brilliant actors apply their craft in a movie that most rewards in the quiet moments between the weighted drama. Whenever I remember that this movie was only ever released on DVD in a full-screen transfer and snapper case, I lament that empty space on my shelf between City of Lost Children and The Clearing. David Mamet’s second gig as director strikes a far different chord than the majority of his more famous films. Things Change is sweet and funny. It’s emotional without pandering. But beneath that exterior gloss is a dark human tragedy that ultimately promises hope. I recently read a criticism that considered Things Change the anti-Being There. And it make sense. 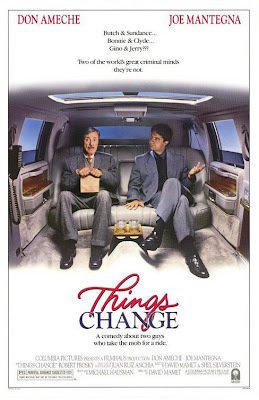 In both, an innocent is transformed by a group of people representing “the institution.” Peter Sellers’ mentally challenged character takes on all the supposed characteristics of civilized society, like a blank slate, and consequently broadcasts clear all of their hateful prejudices. Pessimism underlies the Sellers’ film. Don Ameche’s simple Italian shoemaker agrees to confess to a mob murder he didn’t commit so that he might have a taste of wealth upon his release from prison. Ameche draws out the best in everyone around him, changing the outlook of the less humble and less genuine. Despite all this good he has inspired, however, the mob boss’ plans change, leading Ameche’s cobbler and those he has befriended toward a tense crossroads. The chemistry between Ameche and his handler and confession coach (Joe Mantegna) provides the delicate balance around which the rest of the movie revolves. Mamet’s script lacks the verbal explosions most associated with his films. I’m generally allergic to movies that could be described as “quietly elegant” and I even hate myself for using those words myself. But calling Don Ameche’s timeless performance anything else would be dishonest. It’s the last great starring performance of one of our most endearing actors. I missed my opportunity to talk about Robert Townsend in the Underrated Comedies list, but I'm not making that same mistake twice. Townsend had a way of opening a dialogue across racial lines that more recent writers and directors have failed to match. He was a showman, who snared you with humor – or in this case the recollection of a type of music, an era – and used your attention to have a serious conversation. In this case, he and co-writer Keenan Ivory Wayans use the rise to fame of a Motown vocal quintet to discuss the hardships of the entertainment industry, the inherent greed and racism, but The Five Heartbeats does not fail to call the integrity of the performers into question along the way. The original songs written for the movie (and sung by The Dells) give the band a docu-screen credibility. 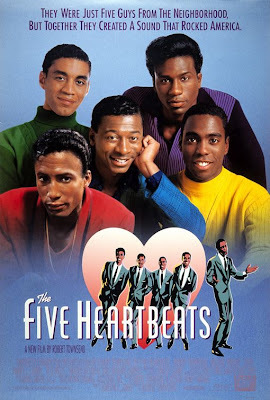 In as much as they were inspired by acts like The Dells, The Temptations, the Four Tops, Wilson Pickett, bad songwriting would have undermined the entire film. The music also forgives some of the goofier bits where the 1990’s “subtlety” slaps you upside the head like a drink from the fire hose. When the Heartbeats reunite at a family barbecue many years after their fame has dissipated, it shouldn’t warm your cockles, but goddammit, it does. Every cinephile has movies that he/she attributes to the expanding of their cinematic consciousness. One of those movies for me is Thunderheart. Odd, perhaps. But I walked out of this Michael Apted film spewing praise. Praise for the screenplay. Praise for Val Kilmer, Graham Greene and Sam Shepherd. Did I know what I was talking about? Pfft. I was merely 14. It wasn't until later that I could talk about Roger Deakins' cinematography that focuses plainly on the poverty endemic to reservation life or the lyrical consideration of Indian beliefs and spirituality or how Apted's history as a documentarian informed his fine attention to detail regarding the people and places that occupy his story. Two years earlier Dances With Wolves garnered all the press and awards, but Thunderheart, behind the guise of a Western-style mystery thriller, explored the same injustice with a more forceful hand. This was the movie that, for whichever of the above reasons, made me want to make movies myself. 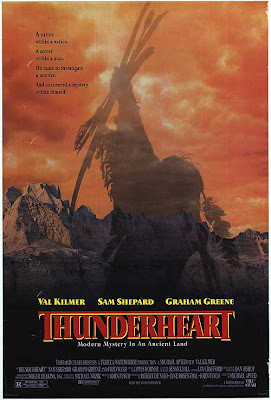 In fact, I wrote about Thunderheart in my (successful!) application to the USC Graduate Film School. While I eventually turned my focus to writing, the passion about movies that Thunderheart helped foster still remains. The quiet solitude of a snow-covered landscape provides the perfect background for understated drama. Smilla's Sense of Snow could have also qualified but even that, relatively speaking, echoes with a certain kind of bombast. 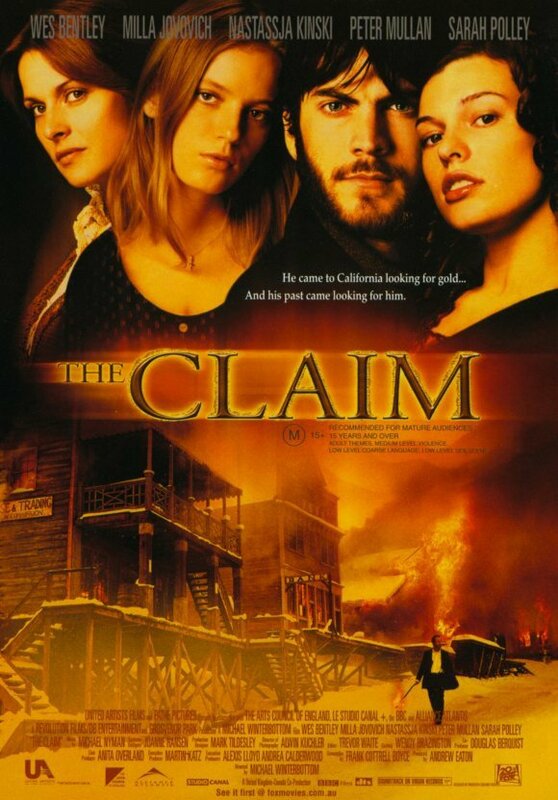 The Claim boasts a largely forgotten actor (Wes Bentley) enjoying his fifteen minutes of fame to star in a period drama/romance/western that nobody really saw. 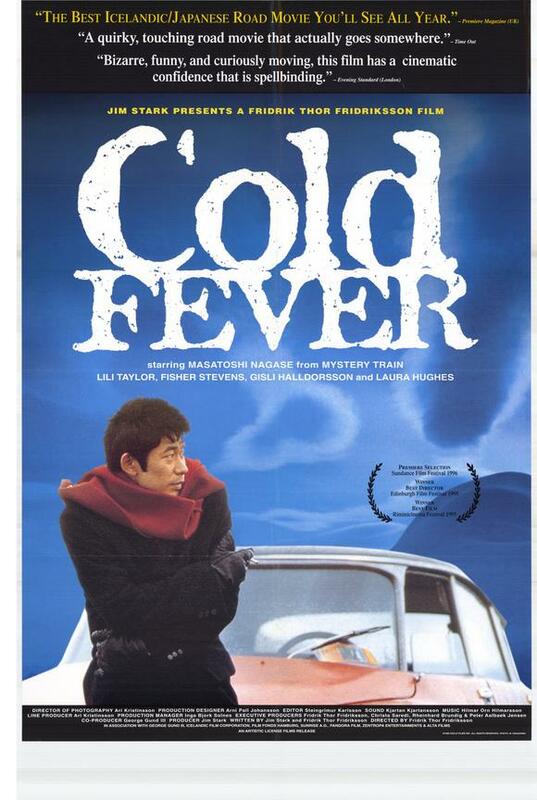 I was in undergraduate film school at the time of its release. I walked in my screenwriting class on Monday and the professor started class by asking "So who saw The Claim this weekend." I was the only person to raise my hand, so he turned the conversation on me. He asked, "What can we learn about screenwriting from The Claim?" I panicked, clearly not ready for the Socratic method in film school classes. I said the one thing I'd loved about the movie. "How to write without dialogue." He pointed at me with a piece of chalk and said, "Everyone in here should see this movie." Michael Winterbottom's tense drama based on Thomas Hardy's novel The Mayor of Casterbridge makes a study of images (the mountains, the perpetual snowfall, horses pulling a house) and dreams (the hardships justified by the promise of prosperous nation). It is also about the ways in which the pasts and presents of the rugged frontiersmen and women endlessly intertwine in this little mining town called Kingdom Come. Sure, you've probably seen it, you probably like it. 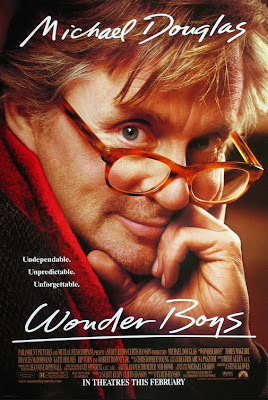 But unless you're talking about Wonder Boys as one of the greatest movies of the last 50 years (or ever), you're underrating it. Michael Douglas' Grady Tripp is one of the deepest, most interesting characters presented on screen. In fact, each character is given time to live and lose in life. They're fallible people, stumbling through life, held back by their delusions or narcotics or bourgeois malaise or fear… Curtis Hanson's follow up to L.A. Confidential further displays his deft touch at creating likable characters out of unlikeable people. No small part of that is Michael Chabon's novel and Steve Kloves' (he who wrote Harry Potter 1-7) adapted script. The movie easily bests the fine book. It's leaner, more focused and Grady Tripp's pathos comes though more clearly. It's the answer to that timeless talking point about movies that improve upon the novel. And I happen to love both. Rip Torn, Tobey Maguire, Robert Downey, Jr., Frances McDormand and even Katie Holmes create fully realized characters with sometimes a minimum amount of screen time. I’ll stop calling this movie underseen or underrated just as soon as someone steps up and gives me a DVD release worthy of the movie. 5A whole lot of very good choices. The one scene in Clean and Sober that kills me every time has to do with Michael Keaton, perched on his bed and throwing Hershey's Kisses wrappers into a giant stack. He's just trying to take his mind off the DTs; it's a heartbreaking scene. Totally get the enthusiasm for Thuderheart as well...we're about the same age. It was one of the first "adult" movies I saw that handled serious subjects. Those are the movies I can speak to; I look forward to tracking down the rest. Yes, WONDER BOYS! So great (I liked the original novel too but the movie is something special). 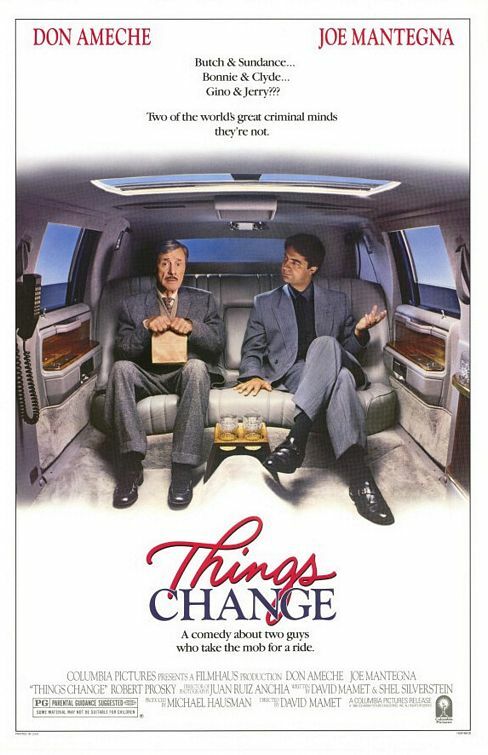 Also great is its Oscar-winning Dylan song "Things Have Changed," the video for which features the singer wittily edited *into* scenes from the actual film. Watch for the line "Some things are too hot to touch"! PICCADILLY is wonderful. It never feels dated, the pacing is great, I can't say enough nice things about it. And the DVD sports some top-notch extras. Great pick ! THUNDERHEART is a fine underrated film. I saw it on a double bill with Apted's contemporaneous INCIDENT AT OGLALA, which is a documentary on the true story behind the film. ABSOLUTELY the way to see it - double bill.